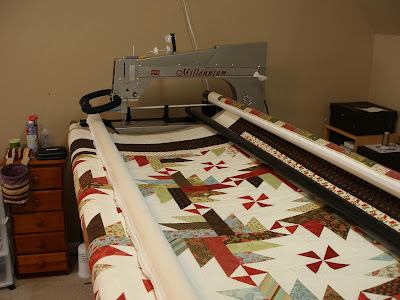 For the past couple months, I have been concentrating on quilting. Matt nicely worked on creating a design board for me that is 8 feet square. 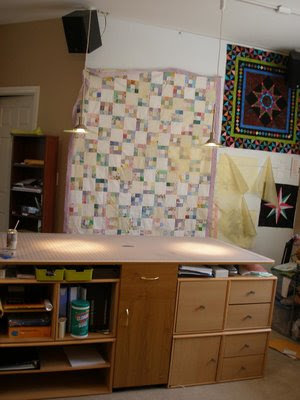 He has also installed lights over my longarm, cutting table and sewing table. He picked out two very cool pendant lights that now hang over my cutting table. I still need to hang quilts on the walls but needed to take pictures, so I decided to post them so that you could see what the studio looks like. 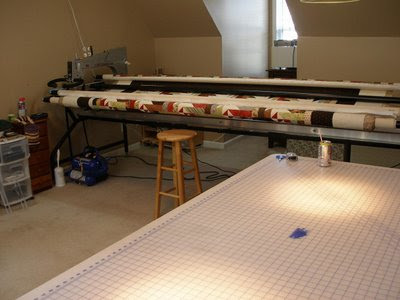 My longarm lives in our bonus room which is over our 2.5 car garage. The first picture was taking from the back of the room where my sewing table is toward the front of the house where my Millie is. Here is the design wall and the cool pendant lights over the cutting table. I use Golden Threads paper to audition designs on quilt tops while they are up on the design wall. I like the cubes that I found that fit under the two wings of my cutting table. They give me a lot of storage and a cleaner look then the Rubbermaid containers that used to be under it. The last picture shows a close up of my Millie and the beautifully pieced State of Grace quilt that I just took off the frame today.